So the government claims. But the evidence fails to convince. There are better options, including targeted sanctions. 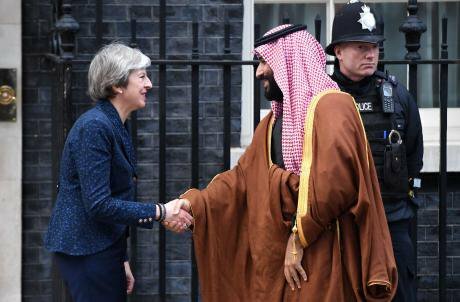 Image: Theresa May meeting Saudi Prince Mohammad bin Salman in March 2018. Credit: Victoria Jones/PA Images. All rights reserved. Do business links improve the UK’s influence with repressive regimes, as the government claims? In the brave new pre-Brexit world, business brings diplomatic influence. Or so we’re told. Theresa May has repeatedly used this phrase to defend Britain’s embrace of Saudi Arabia, while providing no examples of how, when or where attacks were deterred. Saudi school books still promote hatred of Christians and Jews, and the Kingdom continues to fund the spread of extreme Wahhabist Islamic ideology in thousands of mosques across the globe. Together with the Khashoggi murder and the imprisonment and torture of women’s rights activists, how has trade had a positive influence on Saudi’s ruling class? Across Africa it’s a similar story. Since Sudan continues to rank at the bottom of both Freedom House and Transparency International’s indices, with journalists, lawyers and democracy activists routinely imprisoned and tortured, “engagement” has not had much impact. And what of Cameroon, where Liam Fox, the trade secretary, boasts that a British company, New Age, has signed a £1.5 billion deal for Cameroon’s natural gas? Goldie’s statements recall a similar justification for inaction as genocide in Bosnia, Rwanda and Darfur unfolded. Former UK foreign secretary Douglas Hurd framed the killing in the Balkans as “ancient ethnic hatreds,” echoing other Western diplomats, implying both sides were as bad as each other. A year after the war ended, Hurd, then at National Westminster, held meetings with Slobodan Milosevic, later tried for genocide, to discuss the privatisation of Serbia’s state assets. And it’s a similar story of trade first, everything else second, with other repressive regimes. Close business ties with Russia have also failed to lead to an improvement in human rights, the rule of law, a reduction in corruption, or the opening of public space for civil discourse and participation. In James Mann’s 2006 book, “The China Fantasy: How our Leaders Explain Away Chinese Repression,” he argued that Western politicians and businesspeople foster an elaborate set of illusions about China, centred on the belief that commerce will lead inevitably to political change and democracy. Instead, many China-watchers point to the increasingly repressive climate under President Xi and his cult of personality, with a million ethnic Uighur people held in re-education camps, and a crackdown on freedom of speech. The “trade” which UK ministers encourage with repressive regimes is usually British companies selling extractive industry services and equipment, or weapons. Have UK officials not realised that the seller has no negotiating power in a situation where the buyer has plenty of other sources from which to buy? What also becomes apparent from UK ministers’ comments is a confusion about the benefits of trade: when Britain is purchasing goods from repressive regimes it increases the UK’s trade deficit and is of no apparent benefit to the UK economy. Yet, ministers seem unaware of the difference between buying and selling. If trade links fail to influence repressive regimes, what policies might have an impact? How can we use existing international law to protect human rights when our governments, regional institutions and the UN, lack the necessary political will to enforce treaties, conventions and global justice mechanisms? Sanctions rarely reach decision-making elites guilty of atrocities, while their wretched populations bear the burden. However, research indicates that economic tools which carefully target the assets of dictators could have greater impact by making it personal. Having their credit cards refused, stopping their visits to cosmetic surgeons in London or shopping trips to Paris, seizing their villas on the Riviera, and excluding them from high-status global summits makes the punishment humiliating, and therefore much more likely to work. Experience in Bosnia and Darfur illustrates the futility of placing peacekeepers with inadequate mandates into conflict zones. But stronger rules of engagement, backed by political will, would mean that peacekeepers represent the eyes of the world. Romeo Dallaire, the UN commander in Rwanda, believes that if the UN had allowed him to deploy 5,000 troops, it would have signalled its seriousness to the genocidaires. Peace deals often fail because they lack specific benchmarks and punishments for failure to honour promises: they must include punitive measures and enforcement mechanisms. Genocidal regimes, like the Sudanese, know from experience that they can get away with violating the provisions to which they have signed-up, even before the international mediators’ planes have left Khartoum’s airspace. Soft power also comes in the form of entertainment and culture. During the Cold War, West Germany broadcast TV shows into the Soviet-controlled East, and millions behind the Iron Curtain relied on the BBC World Service for relatively impartial news. On occasion, Hollywood has projected an idealistic and inspiring view of life in a liberal democracy that has fired the imagination of people living in repressive regimes. The work of Western charities in the developing world often shows what could be possible. Across Britain’s former empire, there are impressive civil society leaders who are the products of UK-funded schools, and families benefiting from health care provided by UK charities. The sooner we embrace soft power tools such as these, as well as smart sanctions which are precisely targeted at human rights-abusers, the sooner we can reject the binary choice between averting our eyes or dropping explosives from 30,000 feet. As Brexit diminishes Britain’s influence in the world, our government will be increasingly desperate for trade deals, and less discriminating about whom we court - another good reason to develop soft power alternatives to selling what remains of our soul.